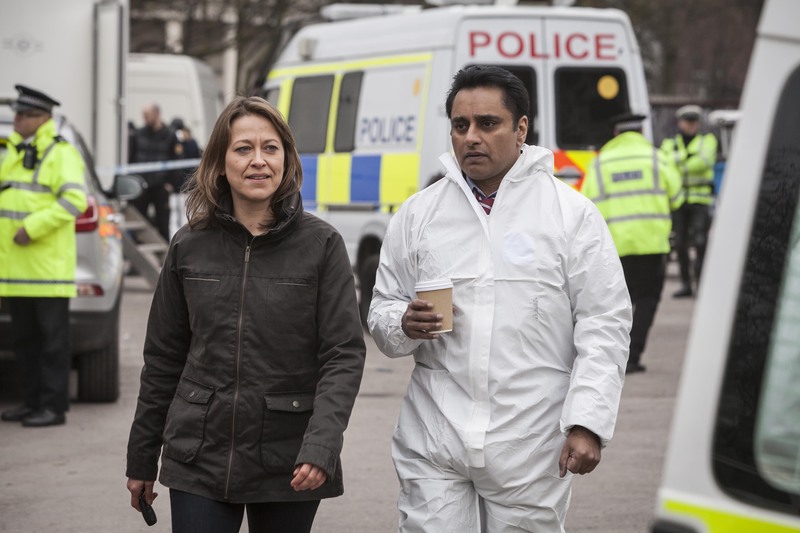 After Suranne Jones cracking performance on BBC One’s Doctor Foster last night, another strong female character comes to the fore in new ITV drama Unforgotten, starring Last Tango In Halifax’s and Spooks‘ Nicola Walker as DCI Cassie Stuart. We were lucky enough to attend the press screening of Unforgotten earlier in the year, which was attended by members of the cast and writer Chris Lang. It’s felt a long time coming for Walker (an Olivier award-winning actress) to be given a leading role. Often producers cast her as supporting characters despite owning every part she takes on and sometimes even out shining some of her co-stars. That’s not to say her co-star, The Kumars Sanjeev Bhaskar lacks in this role as her partner DS Sunil ‘Sunny’ Khan. In fact he’s the perfect balance to the duo. The sceptic to Cassie’s determined pursuit; a comfortable banter between the two that shows a close friendship without all the usual tropes of strings attached. What I really enjoyed about the story is Cassie is a strong female character, but not cold and calculated. She knows she’s good at her job and confident in her ability that her methods will yield results. Cassie is still fun, kind person though, able to display emotions without all the usual detective clichés of a broken tortured soul or a doomed affair/romance. A lot of that is down to the great writing by Chris Lang who has written a group of great characters, and the confident assured performance by Nicola Walker, who even when staring at a screen, conveys the characters excitement at every new morsel of evidence (all those years staring at the screens in Spooks certainly paid off). ITV has had a poor run with its drama output over the last year but Unforgotten is the exception. I’d even go as far as to say, it’s the best drama of the year across the channels so far. Going by the first episode, I think ITV should snap Unforgotten and its stars for many more series.